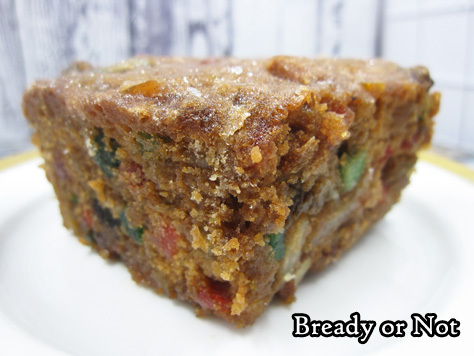 Fruitcake is one of the most maligned holiday foods out there, but people do love it. My dad sure does. 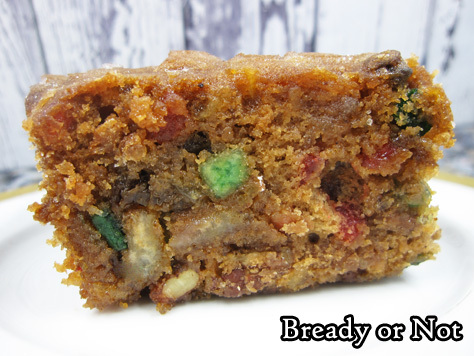 I wanted to make him a fruitcake that proved how awesome they could be. The recipe you see today is one I’ve been experimenting with for a few years now. 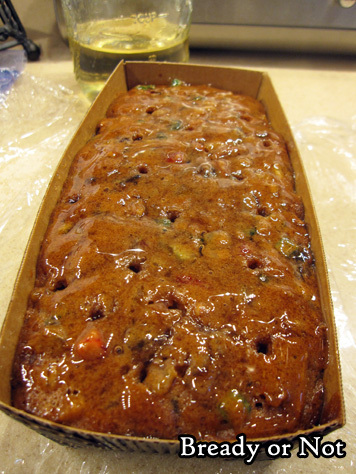 One problem that I had with a lot of existing recipes is that they make a ton of fruitcakes. Therefore, I wanted to find the right recipe to cut in half for easier fridge storage and eventual transportation to California. I used a highly-rated King Arthur Flour recipe and tweaked it a ton. I printed out guides of fruitcake-making advice and incorporated that information, too. 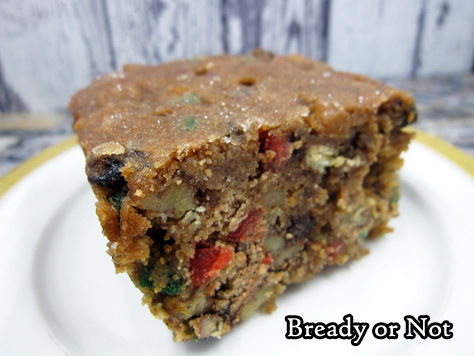 My dad doesn’t like fruitcakes that are heavy on nuts. Therefore, I place more emphasis on the fruit. Customize the kinds of fruits and nuts to your preference. 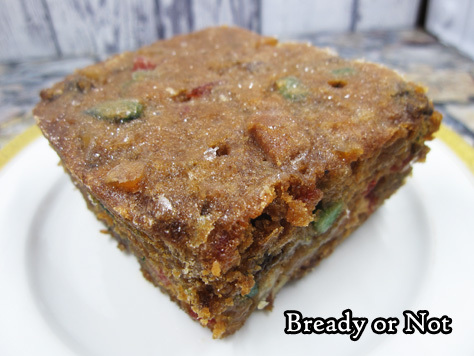 I often use a combination of pre-made “fruitcake mixes” from the grocery store along with dried golden raisins, chopped apricots and dates, etc. Whatever I have in my cupboard or can grab on sale. The same with the nuts. If you hate walnuts, don’t use walnuts. Include just one nut or use a wide variety, just make sure they are chopped up. You don’t want huge pieces. The use of cocoa powder seems odd, but it’s there to add color. That’s a holdover from the original King Arthur Flour recipe. I was afraid that it would add a chocolate flavor, but it doesn’t at all. There are so many other complex flavors going on, it doesn’t stand out. The liquid to macerate the fruit can be alcohol or standard fruit juice. My preference is to get some help from good old Captain Morgan. In the simple syrup, you can also omit the rum, if you so choose. 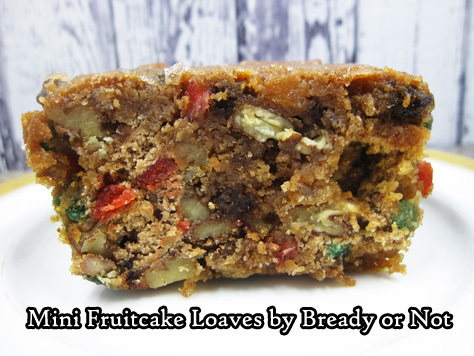 If you have any questions about this fruitcake recipe, feel free to comment on this page or reach out via social media. 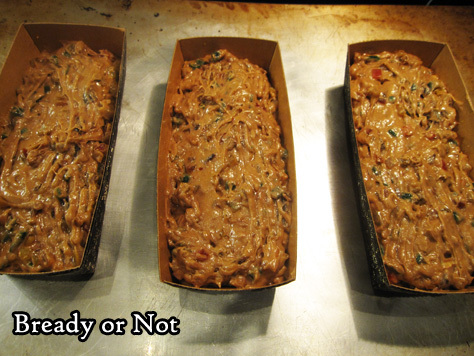 Just don’t wait too long–if you want these loaves ready for the holidays, you’ll need to bake them soon! I advise using disposable mini loaf pans for this recipe. Measurements for these pans vary widely; this recipe was tested with pans that measured 7″ x 2.5″ width, 1.8″ high, and the batter filled three pans. If you’re making these loaves as a holiday gift, plan to bake at least 6 weeks before the gift-giving date. The loaves will need to be basted with a simple sugar glaze each week for those 6 weeks in order to “ripen” the fruitcakes. After the glazing is done, the loaves can be removed from their pans to be frozen indefinitely, or well-wrapped and stored in a cool, dark location for months. Combine the fruit with the liquid of choice in a non-reactive bowl; cover and let rest overnight, at minimum. Combine the sugar and water in a small saucepan. Heat until the sugar is dissolved. Stir in the liquor, if using. Cool completely. Keep stored in jar in fridge to brush the loaves over the coming weeks. Preheat oven at 300-degrees. Place the butter and sugar in a large bowl and beat together, followed by the salt, spices, and baking powder. Beat in the eggs, scraping the bowl after each addition. In a separate bowl, whisk together the flour and cocoa. Add the flour mixture and the corn syrup to the butter mix. Scrape bowl well, then add the juice, the fruit with its liquid, and the nuts. Apply nonstick spray to the mini loaf pans; pan measurements vary, but this recipe should use 3 to 4 pans. Spoon batter into the pans, filling them about 3/4 full. Bake for about 1 hour to an 15 minutes. Cakes are done when a toothpick stuck in the middle comes out clean. If desired, poke the cakes throughout with a skewer to allow more liquid to seep in. Brush tops with simple syrup for the first time. Allow loaves to completely cool, then wrap them tightly in plastic wrap. Store in the fridge or in a cool, dark location. Once a week for the next six weeks, unwrap loaves to brush with more simple syrup (making more in needed). After 6 weeks of ripening, the cakes can be eaten, stored in fridge longer, or frozen.